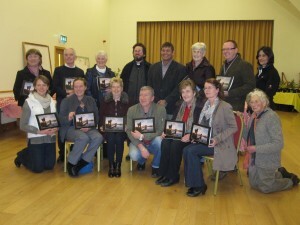 A great night was had at the launch of the Roundwood 2014 Calendar in Roundwood Parish Hall and Centre. Fr Healy officially launched the calendar, congratulating all involved and remarking how it gave a great flavour of life in the area. The calendars were selling fast on the night. However there are still a limited number available for sale from Justine’s, the Roundwood Sunday Market and the Roundwood Inn. 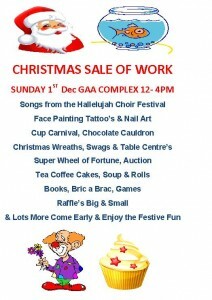 There will also be a Roundwood Calendar stall at the Roundwood & Moneystown Parish Sale of Work in Aras an Tochar this Sunday, December 1st, 12 noon to 4pm. Come along to snap up the last few calendars, great local crafts, bric a brac bargains, books, a few sheep or whatever takes your fancy! There’s also Giggles the Clown, Face painting, tattoos and a possible guest appearance from the man himself, Santa Claus! This entry was posted in News & Events on November 28, 2013 by roundwoodiewicklow. Our parish Christmas sale of work will take place on this Sunday 1st December starting at 12 noon in the GAA complex. This year you will find a cup cake carnival & chocolate cauldron, Christmas wreaths, swags and table centres, along with hand turned candle holders made from local wood. Wheel of fortune, bric a brac, books, home produced cakes & breads, 6th class stall, many raffles including the grand Christmas raffle with 1st prize of €1000 2nd €300 & lots of vouchers from our local businesses, Moneystown hamper, small raffles for Smyth’s toy voucher, turkey, Christmas cakes, art & crafts and much more. Giggle the clown will meet everyone in the hall, Santa will arrive to meet the younger ones at 1pm. Along with nail Art & Tattoo’s the kids can also get their faces painted. There will be lots of games and fun for all. Lunchtime will be covered with tea, coffee, soup, sandwiches, rolls & sweet cake served. The kids from 5th & 6th class will perform a medley of songs from the hallelujah choir festival. The sale will be wrapping up with the raffle results at 3.30pm, sheep & other items will be auctioned immediately afterwards. Be sure to come early & enjoy the community spirit & festive cheer. You will also be able to order your An Tochar Club Gear & purchase the 2014 Community Council Calendar. Donations of All Kinds are essential & most appreciated to make The Sale of Work a success. For further details please contact Caroline Sillery 086 1714973 or any committee member. Admission is free. 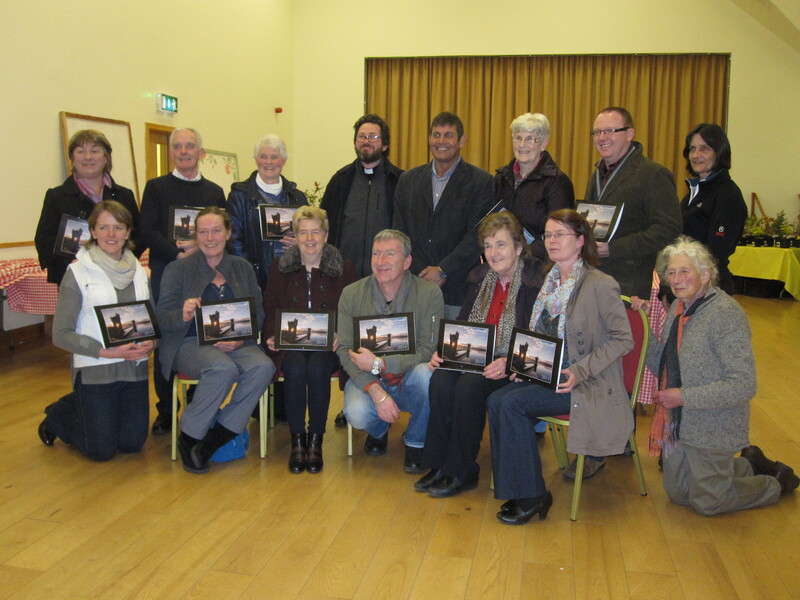 The Roundwood 2014 Calendar was launched last Saturday evening in the Parish Hall. It is now for sale at Justine’s, The Roundwood Inn, the Sunday Market in the Parish Hall and will also be on sale at the Sale of Work this Sunday. It would make an excellent Christmas present at just € 6 but they are selling fast so get yours while stock last. Roundwood Variety Group would like to thank all those who supported their Catherine Fulvio Cookery Demonstration last week. A special thanks to the parents and cast members who supported this fundraiser & to all who came along and enjoyed the night, to those who gave raffle prizes and to our wonderful stall holders. Cross Care will hold a collection of non-perishable food in both Roundwood and Moneystown churches over the next four weeks. Donations can be left in the church porch before or after mass each week or in the parish centre during rhe week, Monday to Friday before 12 noon. The following items are acceptable:- pasta, rice, fruit juice, tea, coffee, soup, sugar, powdered mil, tinned meat/fish, tinned fruit/veg, packaged desserts, biscuits and hygiene produces (e.g. nappies, toilet rolls, toothpaste, toothbrushes, deodorant, shower gels shampoo etc). The much anticipated Roundwood Calendar 2014 has finally arrived. The official launch took place in the Parish Hall on November 23rd. It features photographs taken by our local talented photographers who took part in the digital camera courses over the past couple of years. There is a special price of €5 per calendar for launch night only. It would make an excellent Christmas Present for family and friends both at home and abroad so do come along as light refreshments will be served and admission is free. The Roundwood Active Retirement Group is heading off to the June Rogers Show in the Moran’s Red Cow on either December 28th or 29th. If you wish to put your name down please contact Betty 01 2818703 or Mollie 0404 454407. Improve Your Gaeilge – Maybe you want to be able to help your child/grandchild with their ‘obair baile’ or simply be able to understand the ‘nuacht’ or weather on TG4. If so you might wish to join An Tochar GAA’s Gaeilge conversation classes this autumn. Eileen Patterson will be hosting and has already started on Tuesday nights in Aras an Tochar at 7.30pm. Eileen will not be charging for the classes but a donation of €2 per night is encouraged which will be given to a charitable cause at ‘Nollaig’ If you’re interested please come along on the night. Results for 18th November North/South Catherine McGillycuddy and Brid Clancy, 2nd Rachel Judd and Molly Byrne 3rd Clare Sally and Pamela Byrne, East/West 1st place were Bridie Nolan and Phil Power, 2nd Teresa Leahy and Marion Davis, 3rd Gertie Fee and Miriam Coyle. Taking first place by one point on Friday 22nd were Paddy O Brien and Ger Lenihan from Gertie Fee and Mary Pierce and 3rd place went to June Digby and Marion Davis, East/West victors were the formidable pairing of Margaret Bolger and Noeleen Redmond, 2nd Jim McNamara and Triona Woodroofe and 3rd Maura Gaskin and Bridie Nolan. There will be a progressive 45 Card Game held in the GAA Complex on Sunday 1st of December starting at 8pm sharp all proceeds will go to the Parish Sale of Work. An enjoyable night guaranteed with refreshments served at the break and excellent raffle and cash prizes to be won. On December 20th with music is by the Wicklow Man in The Parish Centre, Roundwood in aid of the Senior Citizens. There was no winner of last week’s lotto. The numbers drawn were 1, 4, 11 & 25. There were fourteen match three winners, Ken & Larry, J McDonnell, Margaret Smyth, Dylon Dunleavy, P.J. Kavanagh, Lisa Coughlan, C. Swords, R. Kennedy, Vinnie, Paddy Duffy, Elain & Sharon, Seamus Tobin, Mary D & Tanya. Next weeks jackpot will be €15,200. This entry was posted in News & Events on November 25, 2013 by roundwoodiewicklow. This entry was posted in News & Events on November 20, 2013 by roundwoodiewicklow.